Tickle Ur Fancy, under jockey Eduardo Gutierrez-Sosa, setting the fastest time for the AQHA Sun Downs Distaff Challenge Sunday afternoon at Sun Downs. KENNEWICK, WA�APRIL 22, 2018�Multiple stakes winner Tickle Ur Fancy got her fifth consecutive win on Sunday when she defeated Love To Reason BR in the second of two trials for the AQHA Sun Downs Distaff Challenge at Sun Downs. Tickle Ur Fancy won by half-a-length while driving under jockey Eduardo Gutierrez-Sosa. She completed the 400 yards in :20.028 seconds to earn a 103 speed index and set the top qualifying time. The Hector Magallanes trained daughter of multiple stakes sire DOMINYUN races for owner Hayden Brothers Ranch. She won the Pot O'Gold Futurity at Sun Downs as a 2-year-old and the Portland Meadows Championship Bonus Challenge last fall. Bred in Oklahoma by Bobby D. Cox, from the First Down Dash mare Sizzling Lola, Tickle Ur Fancy has compiled a (21) 13-3-1 record and banked nearly $84,000. Trainer William Leech saddled Charles Stojan's graded stakes winner Toughie to a neck win in the first trial to post the fourth fastest time of :20.254 seconds, a 96 speed index. 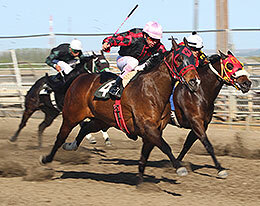 Ricardo Moreno rode the Grade 3 Canada Quarter Horse Cup Futurity winner to her 13th win in 19 starts. Edward C. Allred bred the daughter of Stel Corona in California from the Hawkish mare Hard Lining. She has earned $162,626. The multiple stakes winner was a finalist in the Grade 1 Ed Burke Million Futurity at 2 and finished third in the Grade 3 AQHA Derby Challenge Championship in 2016. The top two finishers in the AQHA Sun Downs Distaff Challenge will also earn an invite to the Grade 1 $100,000-est. AQHA Distaff Challenge Championship on November 17 at Los Alamitos Race Course in Cypress, California. For a complete list of Sun Downs Distaff Challenge qualifiers, times, sires, dams, owners, breeders, trainers and jockeys CLICK HERE.